Remember a year back when I had posted a tutorial on DIY calendar? I hadn't uploaded all the images that time. 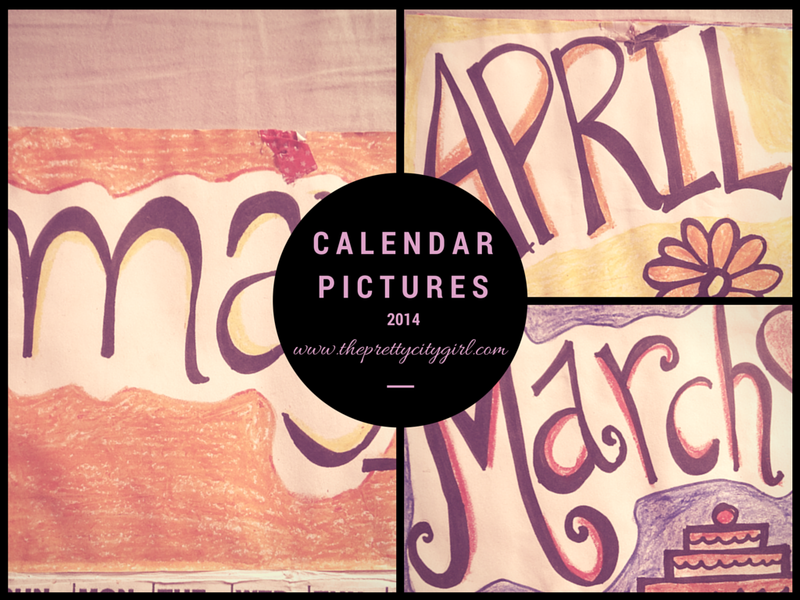 Before throwing away 2014 calendar, I thought I should click pictures of the calendar and post on TPCG. I felt sad while throwing the calendar away. This year, I have put up a sleek calendar on my wall. Let's see if I will make a new one, or keep this sleek calendar as it is. To start with the post, January comes first. I have used colours according to every month's type. For example, to start the year, I have used Pink and Purple. I have used Red as February is always known for the Valentine's Day, and it is known as the Month of Love. I have drawn a cake here as my birthday falls in the month of March. And about the colours used? I have no idea why I have chosen these two. April is more of Yellow and less of Orange. As April is a hot month, I've used these two colours. The flower denotes Spring here. It is crazily hot in Mumbai in the month of May. To support this statement, I have used orange and have drawn a sun! I should have used July's theme for June, and vice versa. Apart from that, the reason why I've drawn two little hearts here is that my mother and elder brother have their birthdays in this month. June and July are the monsoon months in India. This was the most childish designs of all the twelve. Though we do not have Fall in India, yet, I went with green and brown colours for August. I loved the font style here. September's colours were chosen randomly. I find this font to be magical (due to the edges of the letters). October was supposed to be a fun month. I had drawn a Diya, as Diwali had fallen in October last year. Apart from that, I also used sparkles to decorate the picture. Remember the Violet/Purple/Lavender Theme of November that I had displayed on Instagram? This was the inspiration behind it. Like September month's theme, even this theme is random. The only colour left to use was the skin colour. As December is sparkly (and also a Christmas month), I have used this theme. If you have observed, I had used these similar themes for the images in the post '2014 Favourites'. Are you making a calendar? Or buying one?